ANOTHER TRASH AND TREASURE SALE HAS COME AND GONE, AND I WANT TO THANK EACH OF YOU WHO PARTICIPATED. 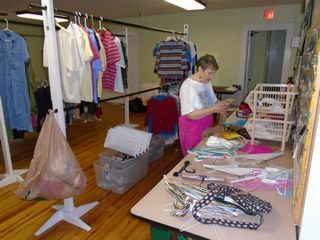 WE HAD SOME INCREDIBLY FAITHFUL FOLKS WHO WERE THERE WORKING ALL DAY, BOTH DAYS OF OUR SALE. THESE LADIES WERE GRACE, AUDRIE, SUSAN, SUE, JUDY TIPTON AND PATRICIA. ALSO THERE…OUT IN THE HOT SUN EACH DAY WERE GLEN, WHO WAVED IN THE UNSUSPECTING FROM THE MAIN STREET AND RUSTY, WHO TOLD THEM WHERE TO PARK AND MADE A YELLOW JACKET MAD, AND GOT STUNG. 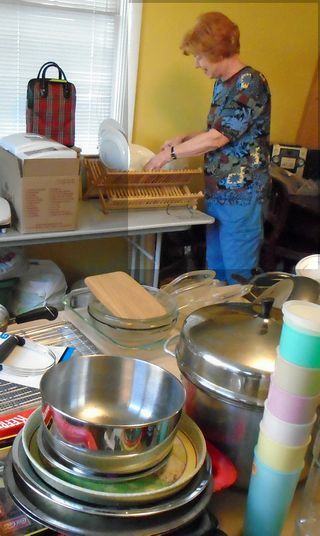 AND ON SATURDAY JEAN AND SUSIE HELPED OUT. THANK GOODNESS FOR PAUL AND JOHN, WHO MADE APPEARANCES EACH DAY AND WERE THERE TO HELP CLEAN UP. OUR CLEAN UP TOOK OVER TWO HOURS YESTERDAY AFTERNOON AND WOULD’VE BEEN MUCH LONGER IF JOHN AND MARIE STEENSMA HADN’T COME TO HELP. 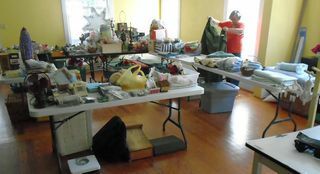 THE PORCH IS LOADED WITH THE STUFF WE DIDN’T SELL. CHRISTIAN LOVE IS SUPPOSED TO COME ON TUESDAY TO PICK IT UP. 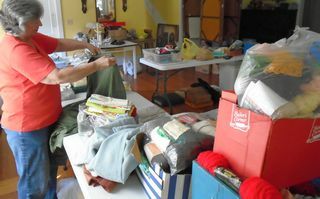 IF THEY DON’T TAKE IT ALL, WE WILL NEED VOLUNTEERS WITH TRUCKS (OR BIG TRUNKS) TO TAKE IT TO OTHER THRIFT SHOP DROP-OFF PLACES. WE CLAIMED A VERY NICE CABINET THAT HAD BEEN DONATED AND WILL USE IT FOR THE KIDS BIBLE CLUB SUPPLIES. IF YOU LEFT ANYTHING IN THE KITCHEN NEAR THE MICROWAVE, PLEASE LET ME KNOW AND I’LL SET IT ASIDE, OTHERWISE ALL THOSE DISHES ETC ARE GOING TO CHRISTIAN LOVE ON TUESDAY. WE WILL NOT SELL CLOTHES NEXT YEAR. SO..WHEN YOU’RE CLEANING OUT YOUR CLOSETS AT THE END OF EACH SEASON, PLEASE TAKE YOUR CLOTHES TO YOUR FAVORITE THRIFT STORE. THE COINS HAVEN’T BEEN COUNTED YET, AND JILL IS LISTING TWO ITEMS ON EBAY FOR US, BUT SO FAR WE’VE MADE OVER $2500. WHILE THIS ISN’T AS MUCH AS IN YEARS PAST, JUST REMEMBER THAT ALL THE MONEY WE MAKE GOES TO OUR MISSION EFFORTS. AND GOD IS MORE THAN ABLE TO DO A LOT WITH A LITTLE.